With 26 per cent of Kenyans facing malnutrition, the Ministry of Agriculture under the department of Crops and Development has come up with the Flour Blending Initiative. This initiative is part of the Kenya’s Big 4 Agendas aimed at contributing towards food security, improve nutrition and employment opportunities in Kenya through flour blending based on underutilized high value foods by 2022. Wheat will be blended with sorghum, cassava and sweet potatoes while maize flour will be blended with cassava, millet and sorghum. 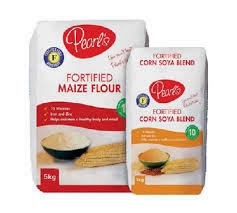 However, there will be plain maize flour on the shelves to cater for those with allergies and other complications. No food colour will be allowed and the product has to retain the colour of the grains blended. Prompt action needs to be taken as malnutrition poses great consequences to the children and the future generation and therefore the Government will start public sensitization on the nutrition value of blended flour mid this month and the end product is expected to be on the shelves by November this year.